The following is MINE OWN OPINION! I'm being brutally biased, and I'd love to hear your thoughts and see you shred me to bits! I might be known within the 40K G+ community as a primarine hater, or at least I'm about to become that; I've decided, here and now, to give as in-depth of an overview as I can muster of their aesthetic. This post will be only in regards to aesthetic, as I'm sure many, many others have detailed lore and rules (if there are any decent copies floating around? ), besides, I'm a kitbasher, and in the grim dark future there's only fashion... Also, seeing as I'm in the middle of a million projects and have nothing major to showcase yet, I may as well get some new content up to keep the blog relevant! RIGHT! 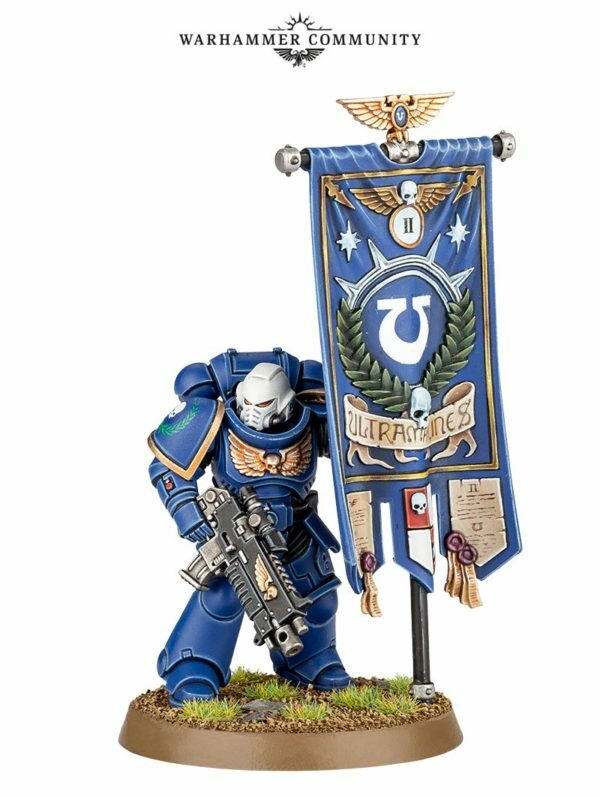 Here we go: taking imagery from the Warhammer community, and presenting them in the order they appear, let's first have a look at the intercessor squad, and the primarine as a whole. Okay, they're closest thing to TS than we've had so far, and I suppose it's the Imperial answer to the scale creep that the forces of Chaos have been experiencing. These chaps appear to suffer a bit from T-rex syndrome, but what looked (to me at least) like slightly-too-short arms is actually more realistic proportioning, and that's nice! ...But unfortunately, I think that's all the nice things I've got to say... The suit itself is pretty self-explanatory, taking elements from all the previous marks that worked over the ages-- I'm led to believe that MK IV was the best of it's kind before Mk VIII, so the helmet was an obvious choice. You know, this mark X business is a bit shifty... what happened to nine? 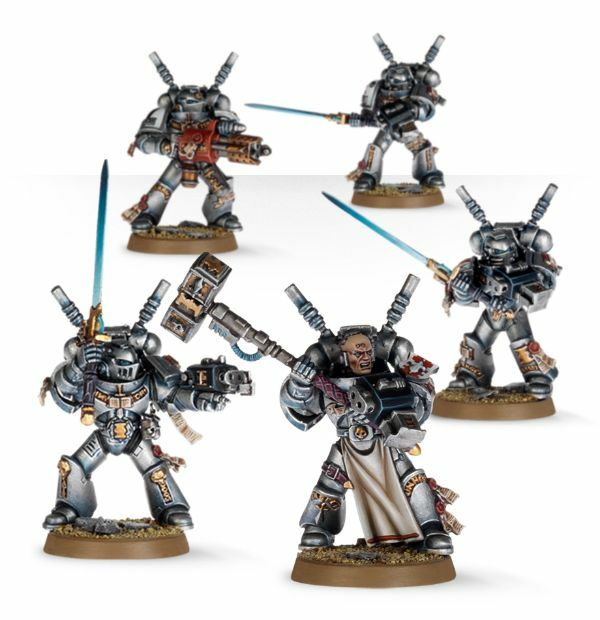 Are we perhaps going to get an Aliens 4 scenario, with Mk IX being some tragic mess, or is that the mark of the Grey Knights? Never mind, I'm not supposed to talk lore-- CONGLOMERATED and WASHED OUT! That's the suit's main problem! I've finally found the words! 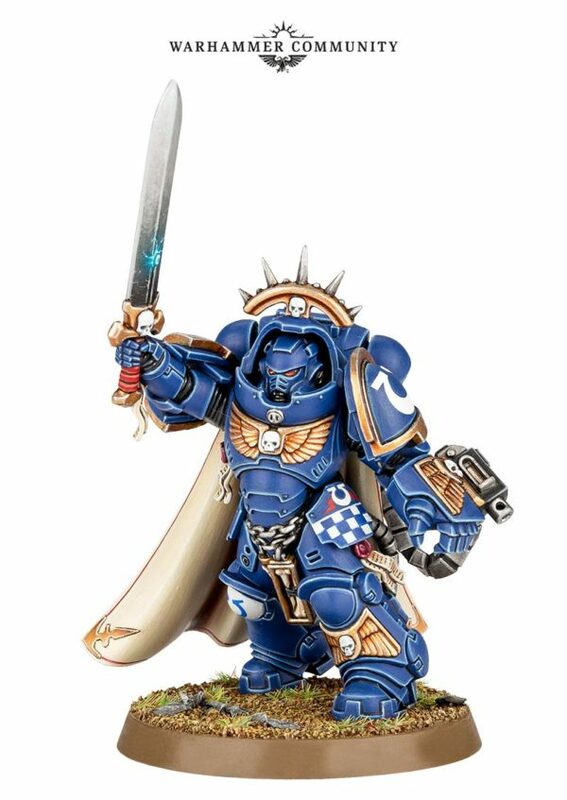 Not only is this a mix, a crossbreed (or what folks in the pet industry call "an Oops") of every set of power armour in Imperial knowledge-- just about-- I'd like to know how many people worked on this model's design. 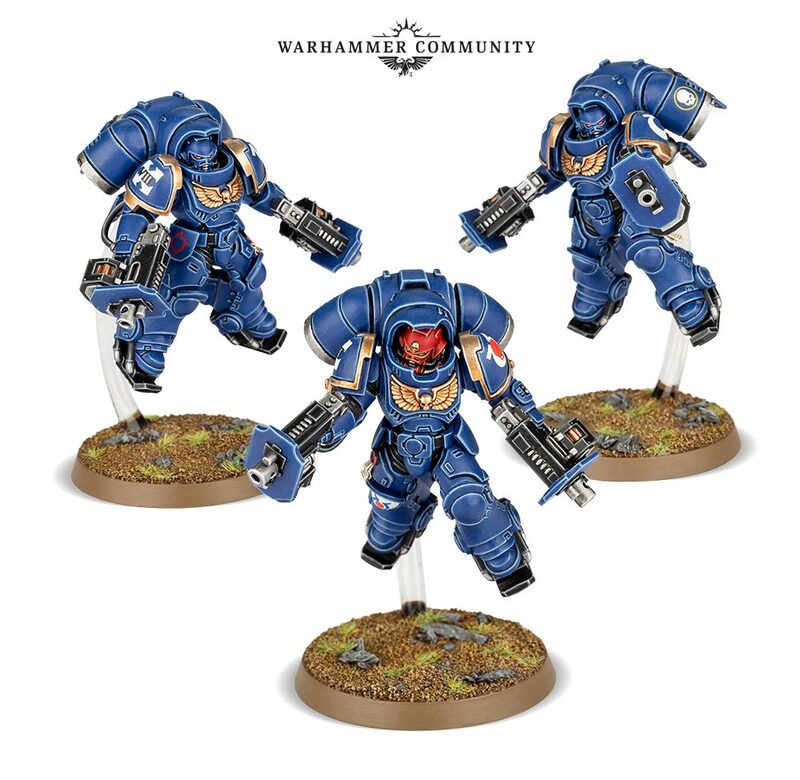 Primaris armour doesn't possess enough style of it's own to be stand-out enough in my opinion. 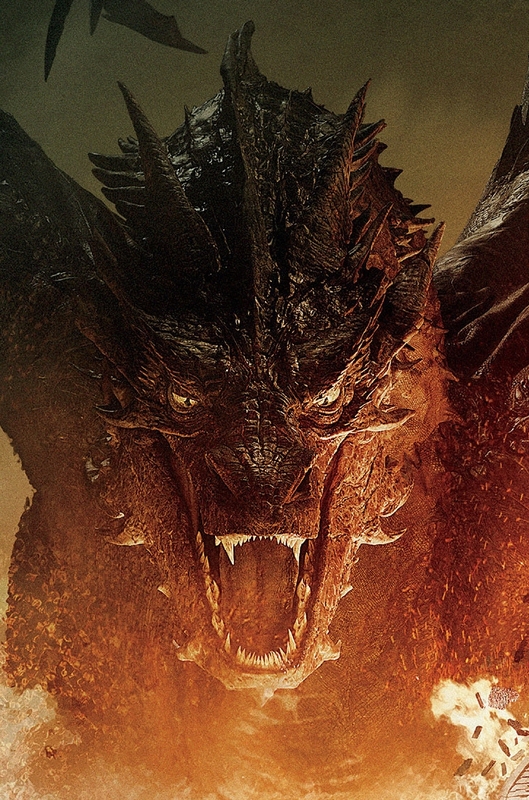 Let me see... One example I can bring up would be Smaug the dragon wyvern from The Hobbit movies. Now, let's ignore the fact that Tolkien depicted him as a four-legged dragon... While yes, he is rather cool in the movie, I believe too many designers worked on him, making him bigger and bigger as their ideas bounced off each other and changing his appearance bit by bit to be more "multicultural" as the wiki says: I might reword that "bland". He possesses the styles of too many people, he's not his own thing, he's not tied together as well as he could have been aesthetically, for instance if only one artists worked on him. Have I managed to explain myself? 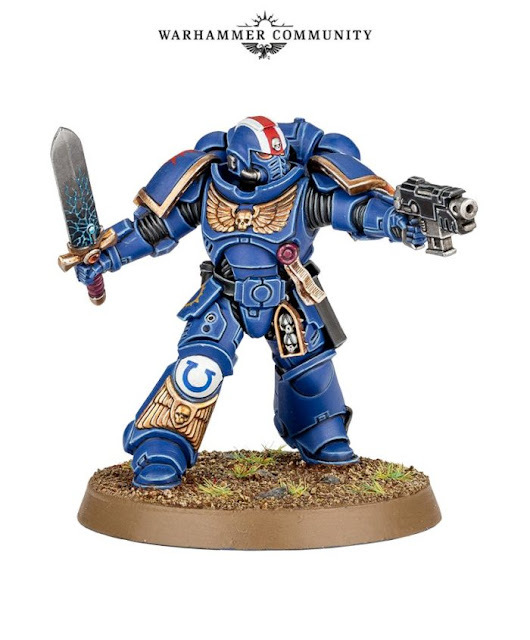 I'm probably wasting my time-- hell, someone's going to tell me later that Jes Goodwin designed the primaris suit alone, and I'll have to go sacrifice myself to the first flame! Also, not really feeling the longer bolters. A bolt is a miniature missile, and the redundancy of longer barrels (though I know they exist, stalker patterns etc) gave the boltgun it's signature feature; stubby and blocky. I like that! 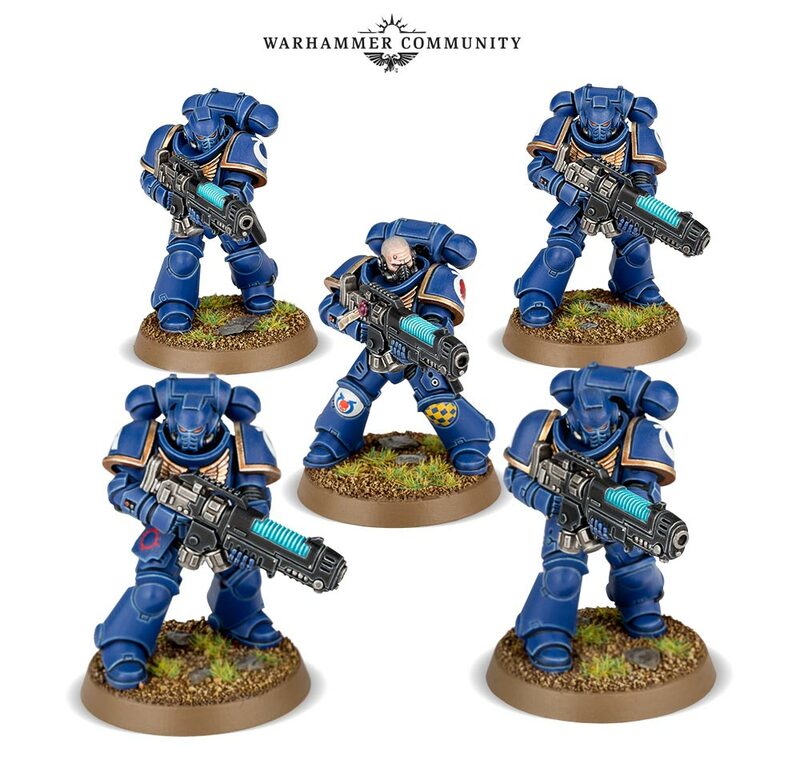 These new guns look like the sort you pick up of AI enemies in an FPS. Again, too bland for my books. Well Throne, that was a paragraph and a half. Let's have a look at the hellblaster squad, or more to the point, the Tau flamers they're carrying. No, still not sold-- though I never field plasma myself if I can help it, so I'm hardly an authority! (and no, I don't care if they don't Get Hot) Mm, I even see an M15/BR85HB/M41A carry handle on the top. Sadly, it's just another thing in their appearance that counts towards my not liking them. Now, let's have a look at those Interceptors, shall we? Oh WOW, but did they ever take a turn for the better! A perfect blend of sci-fi and classical germanic plate armour, greatswords and all. The huge storm bolters are pretty cool too, evoking classic elements like Pedro Kantor's weapon and the Gauntlets of Ultramar. I can see myself taking inspiration from the Soul of Cinder for a small Interceptor force, and it'd look amazing I'm sure. Pfft... I mean, Oh Gods. Is this what happens when GW designers play too much Overwatch? And Starcraft? No, seriously, look! I'm not into Starcraft by a long road, but the CMC is somehow nicer to look at with my eyes than these abominations! Okay-- okay, I need to calm down. I'm not a nerd, I'm not allowed to nerd rage. What's next? A lieutenant? That's an autopistol he's carrying. Straight up. Ah, and HERE's a fine example of my second biggest gripe concerning the primarine kits. So they're supposed to be the best there is, right? Super cutting-edge technology and effective weaponry and all those gubbins-- so why would he feel a power sword would be necessary? There was a reason classic Astartes carried swords, and it wasn't because they were effective. Swords are really only of any importance-- in the 41st millenium, at least-- in symbolic terms, as evokers of past heroism and conquest, to be passed down from master to disciple. The golden sword of 4th captain Idaeus, the ten Black swords of the Templars, the Four Heavenfall blades of the 1st legion, those few examples are all ancient weapons, borne into battle, more as icons than effective weaponry. Here we have a space man who had a sword slapped into his hand and was told to cut things with it. When they did this in Destiny, somehow they made it work. Here they didn't. Never mind, the primaris "ancient" is next. Again, why!? A banner, really? Efficiency and technology and an embroidered banner? It just doesn't fit. I mentioned something similar in my rambling thoughts post concerning the Cult Admech book, that the once-seamlessly fitting aspects of tradition and almost pagan religion feel tacked-on and redundant. Why would primarines need standards? Or reliquaries? Or even purity seals, a staple-- omni-staple, in fact-- of classic 40K? 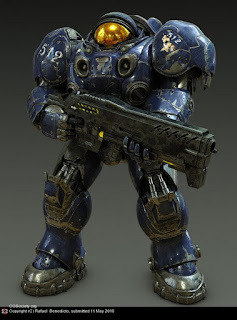 And here's a space marine cosplaying as a space marine. Wow, but if we don't see the true Starcraft aesthetic showing through now, there's even a bit of Fallout in the helmet. Both the terribly simplistic iron halo and the power fist are silly and redundant for the reasons I tried to explain with the lieutenant, and the bolt weapon blu-tacked to the gauntlet's side is in the most disguising location they could have chosen. Funny thing is, if you want me to tear the new plague marines to bits, you'll be disappointed. I love them! 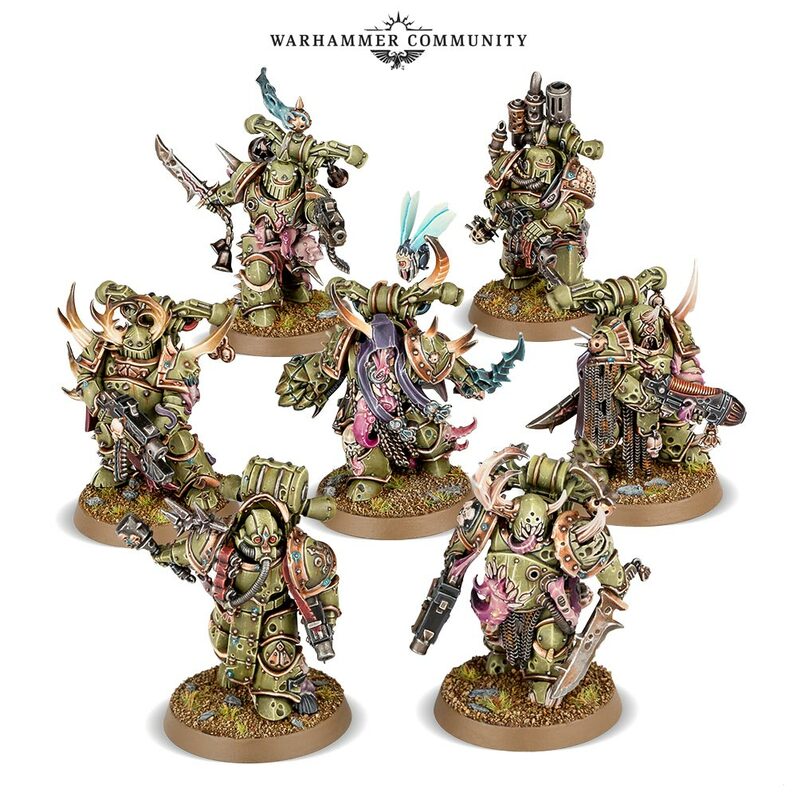 They're closer to the old skool Nurgle art than we've ever had, and I'm going to wait until these chaps are available as their own unit before beginning an army of pestilence! And that bottom left fellow, remember that helmet design? Kind of, you know, like a reversed SM helmet with a shoulder pad behind it? That is the BEST homage ever! ... So now the problem is, there's nothing left to rage at, so I might have to stop there. Hope you managed to glean a bit of insight to my mind. Hee hee, my biased and steeped-in-the-past mind that cannot accept change. What do you think then? Do you agree with any of my arguments, and to what extent? I'd love to hear your thoughts, and again, feel free to roast my opinions too! So yeah. June 18th. Bye bye for now. Together with the help of your unquenchable friend Joe (you know Joe! ), we bought you a present. Don't open it until you move into your new place, will you? And make VERY sure Past Lonely finished up the best part of those commissions he's been chipping away at, or you'll be sorry. The scion's not yours, though; that's Joe's. Hope you're still happy and haven't killed yourself by then. Maybe "C" has come back to you? Do let me know how you're getting on in that new place. Looking forward to seeing you in the future. Hope you enjoy the present, and do make sure to thank Joe; if he wasn't so on-the-ball, we couldn't get it into the country! Throne, but I really should have chosen a better backdrop than this... Oh well! So here's my entry for a little painting competition held over at the 30K G+ community over the last 30 days. 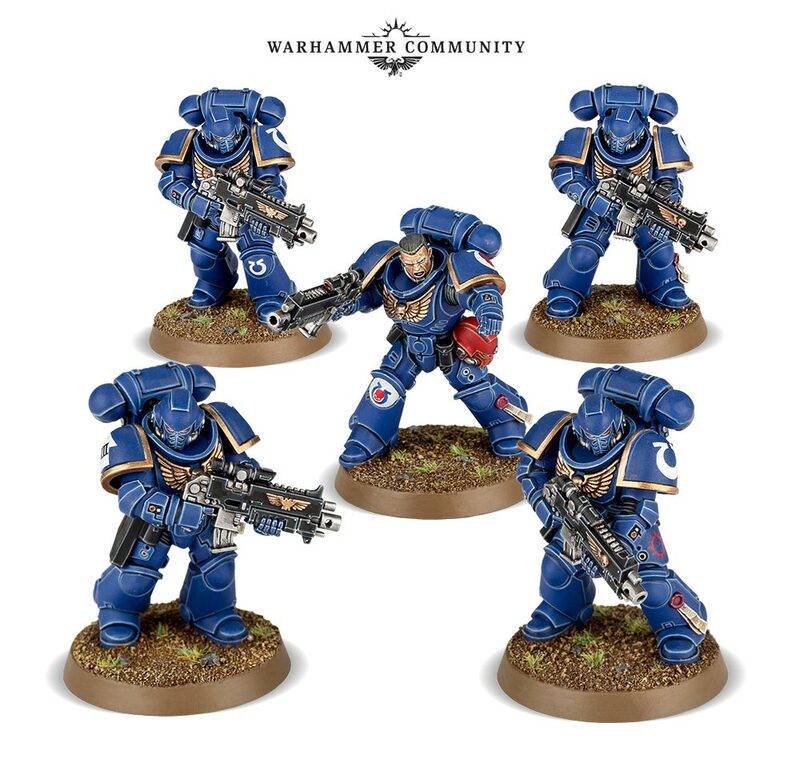 Entrants were given a randomly selected legion, and as much as I was hoping for a World Eater or an Imperial Fist I was allotted a Thousand Son! Certainly something to stretch the mind, seeing as the scions of Magus never really appealed to me; but as you see, I didn't really try anyway. Ha! Red's the most difficult colour to paint, by the way. The instructions were a bog standard tactical brother, so I did what I could to make him interesting. First and foremost, I don't like the eyes on my MkIII helmets, so I take them off. A sister of silence flamer is nice, and small enough to be one-handed along with a chainsword, something I remember in a lot of classic art. The bare arm is because I like using skin as a spot colour more than anything. In other news, I've just put the finishing touches on the jade sisters of silence. Green's the most difficult colour to paint, by the way. Again, so glad for commission work, I know now I never want to paint sororitas--of any kind-- as a playable force! They're just so damn fiddly. Right! As always, got a lot of stuff on, which is why I have been so neglectful of the poor old blog. I'm really tired right now, so sorry in advance if this all gets a bit silly and hard to read. There's also a long-winded ramble at the end about a Nice Idea of mine, just warning you now so you're not shocked at it in comparison to the amount I wrote for my (more important) WiPs. Here's a lot of pieces. Look at them all, isn't there a lot? I wonder what I'm going to do with them all... Part of my custodes commission includes a contemptor dreadnought, which I like to think I'll be magnetizing. Here's the three arms, or at least where I was up to last. The two gun arms are going to have two ends each; The first will have a melta and a flamer, and the second will have an assault cannon and a heavy bolter. I'm assuming a contemptor dread in 40K is allowed the same loadout as a vanilla one? Taking cues from Fortitudo, I decided to give the contemptor a cherubic visage on its front. I don't know what stopped me from going out and buying a doll straight away... I spoke to my mum, and she was willing to part with one of hers, for a price. Anyway, if you wanted to know what Kelly looked like without a face, there we are. Shotgun collar victim. This sort of thing. Pipes and some fancy greenstuff work that I can'tthinkofrightnowbecauseI'mtootired (inhales deeply) should tie it together nicely. Right, so here's where I'm up to with the contemptor. Thoughts so far? Obviously, there's a LOT of work to be done, but it's just a matter of getting there. More skaven. Actually, these chaps are all primed now. Another commission piece I'm chipping away at is a Tzeentch IK, and it's proving a very interesting piece to be sure. I need to be careful not to go overboard or, as usual, I'll never finish it! I'm particularly enjoying this one, as I can do pretty much ANYTHING, so long as it doesn't look really stupid. Also spamming a new sort of ribbing I just got good at. Slow progress on the anti-capitalist Tau character. Ah yes, here's a buy I'm proud of. All three at once, VERY happy with them, 'specially as I don't own most of the WDs they feature. I'm aware the apocrypha series were received poorly for that reason, they were all just copy/paste WD articles, but I personally am fine with it. I need to give these books a decent review later. ...Hey, I saw the hourglass and panicked, okay? RIGHT! Now for the long-winded ramble! Here's a teaser for something big looming on the horizon. Not physically, like any large vehicle or walker I may or may not have alluded to on G+, *cough* but a generally big story with even bigger potential I'm adding to here and there. One day it might see the light of day, I don't know. 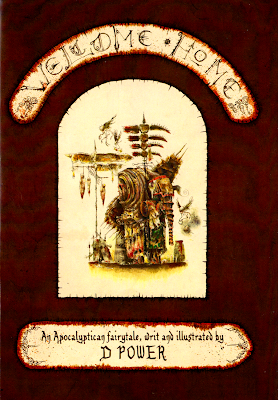 Last post was about a fictional game I invented for the story, a series called Astronomica. I've been mulling over the idea for a while, and I'd really like to see it expanded on in some way. It's basically Warhammer 40,000 if portrayed by Fromsoftware, not a crossover, though it borrows certain elements-- that of Astartes being undead in reality etc. The overbearing style will be a step away from Blanchitsu; a drier, blacker, more burned feel I reckon. Not trying to be the next Blanchitsu-killer, of course! The concept of Astronomica, as I like to envision it in the future, is a general collection of lore-building and all-round fun times with fellow Dark Souls/Warhammer enthusiasts sharing an interest. Together, I'd like for us to build a world around this concept, throw together some nice models and maybe even base a few skirmish games around it. I'm currently putting together some stuff for you to read and maybe find inspiration, as well as a model or two (or a whole squad), but yeah! Suddenly cutting my ramble short there as I'm WAY too tired to carry on! I so awfully want this to become a thing, I know we can have a lot of fun with it! I'll put up a post later detailing what I hope to achieve with the whole concept of Astronomica, and I'm going to have to spread the word around somehow. And that's that, I think! A whole random lot of stuff and the desperate ramble of some poor soul. 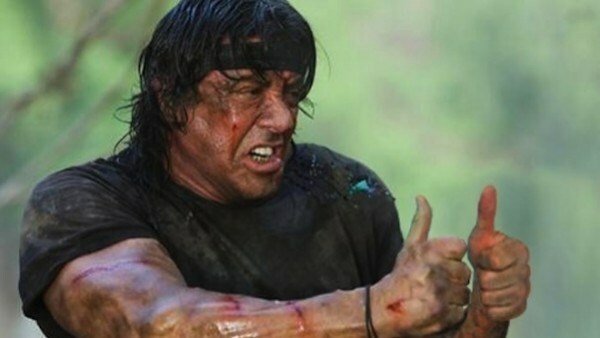 Next post I won't be so tired, I can promise you that.